Home / featured / Opinion / Toby Gould / The end of UKIP? Some would say that Ukip fell apart after this year's general election, after failing to gain any seats and, instead, losing one. But somehow Farage managed to maintain power over the party and they've managed to linger around ever since - perhaps as they are deemed relevant to the seemingly always-topical upcoming (i.e. 2017) EU referendum. A good example of the continuation of their annoying presence in UK politics is the Oldham by-election. Ukip were hyped up to do well. Corbyn's Labour were in serious trouble - could they lose this safe-seat to a party under Farage's leadership? No, they couldn't and didn't. Labour took 62% of the vote while UKIP came a very distant third with 23%. And how did Mr. Farage react to this news, as a serious leader of a serious party? He suggested that there was postal vote fraud involved. But now there has been a new development in the (seemingly-never-ending) Ukip saga. Douglas Carswell, Ukip’s only sitting MP (after he defected from the Conservatives), has said the party is in need of a "fresh face". In an interview with the BBC he criticised Farage's handling of the Oldham by-election and concluded that change was the only way the party could get to "the next level". So how did Farage react to this fairly moderate criticism? The only way he knows how. He told the BBC that Carswell should "put up or shut up". Hardly the words of a professional party leader who claims Ukip is not a personality cult centred around him. The ever-loyal deputy leader Paul Nuttall then chimed in to say that Carswell would be "humiliated" if he challenged Farage on the leadership. 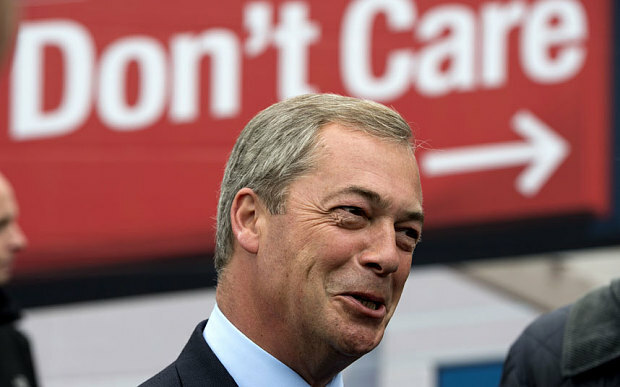 Did Ukip consciously decide to take an aggressive tone on dissent? Or has it always been in their nature? Looking at past events I would have to conclude it is the latter. The real question here is: will anything change? Somehow, I think not. Farage will maintain control over a party that is shrinking and, very, very slowly, falling apart. We've seen that he is not prepared to let the power he holds over the small group of people he surrounds himself with go. He acts aggressively and defensively against any form of dissent. Not only have we seen this with his response to Carswell's comments, but when Suzanne Evans (who wrote the 2015 manifesto and was appointed acting leader) gave an interview saying Farage was seen as a "divisive figure", he shut her out of Ukip completely - an email was sent round saying she was not to be briefed on any subject by the party. The Ukip press office was told not to contact her again. Ukip is a dictatorship. If we thought that prior to the general election, then events after have highlighted it in even more detail. And that is why UKIP is seemingly lasting so long - they survived failure at the general election and numerous failures since. But Ukip will slowly fall apart. As the public grows tired of their divisive rhetoric, Farage will have to become more extreme in order to maintain control and stay 'relevant'. Carswell clearly means well for the party - and his suggestions are absolutely spot on. But with Farage in charge it is inevitable that these changes, which are the only way Ukip can survive in the long term, won't come. And that is why we'll see Ukip, like many dictatorships, slowly disintegrate and fall apart.